Q: What did the papa tomato say to the baby tomato? Q: Why did the tomato go out with a prune? A: Because he couldn’t find a date. Q: How do you fix a sliced tomato? Q. Why did the tomato blush? A. Because he saw the salad dressing. Q: What did the macaroni say to the tomato? Q. 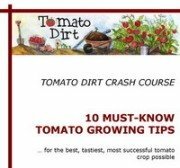 How do you get rid of unproductive tomatoes? Q: Does Santa like to grow tomatoes? A: YES -- he gets to hoe, hoe, hoe! Q: What is red and goes up and down? A: A tomato in an elevator. Q: Why did Mrs. Tomato turn red? A: She saw Mr. Green Pea over the back fence. A. Because if it was long, skinny, and green, it would be a bean. Q. How life is like ketchup? A. Like ketchup, good things in life come slow and are worth waiting for.